As we celebrate/mourn (delete where appropriate) a new Presidency, there has never been a more opportune time to remember some of the past figureheads that occupied the White House, and I’m not just talking about former Presidents. Namely, Jaqueline Kennedy – the wife and First Lady to John F. Kennedy – who became an adored figure during her husband’s time in the Oval Office, including as a fashion icon and even as a television personality. However, despite everything she did, her ultimate legacy was tied to that of her husband’s, as she was sitting right next to him in the presidential limousine on that fateful day on November 22nd 1963, and is now best remembered for climbing onto the back of that vehicle in her pink outfit to pick up a piece of his skull. This is where Pablo Larraín’s biopic Jackie comes in, with the sole purpose of filling in those gaps between that fateful moment and everything that transpired afterwards, and it paints a haunting but profoundly elegant portrait of a woman in grieving, who also happens to be someone very much in the spotlight. The film is told mainly in flashback, with a framing device of a reporter (Billy Crudup) arriving at the private residence of the bereaved Jackie (Natalie Portman) to take notes for a tell-all account from her point of view. We see throughout the film her immediate reaction to her husband’s assassination, an unhealthy mix of trauma and survivor’s guilt, and as plans are made for the fallen President’s funeral – which Jackie insists be on the same spectacle as Abraham Lincoln’s funeral, despite her husband not accomplishing anything quite on that level – Jackie must also attempt to contain her grief and overwhelming feelings of depression for the sake of those around her, from the mourning public to her own family, as well as to make sure that the legacy of her husband – and by extension herself – is fully preserved. The first time we see Jackie in the film, alone in a gorgeous and large home that eerily echoes Gloria Swanson’s living conditions in Sunset Boulevard, she is clearly a shell of her former self. Gone is the composed figure with the sweet smile, and in her place is a chain-smoking recluse whose only passage to the outside world is the reporter who comes her way. After we see the things she has gone through, from the assassination itself to the pressures of maintaining her husband’s legacy in the days immediately after, can you really blame someone like her for acting this way? Director Larraín and the original screenplay by Noah Oppenheim really cut through the core of its central figure, analysing her every move in the moments leading up to and following on from that day in Dallas, and making us understand why she acts the way she does, how she somehow retains her composed figure even in the wake of tragedy, and whether or not her defiant acts to ensure her husband gets the send-off she feels he deserves is really for his memory, or for her selfish desire to always be in the spotlight. This angle really works for a biopic like this, as it allows us to learn something new about the person we always associated with wearing that pink dress and nothing more, and it explores exactly what make Jackie the person that proudly stood in that spotlight for the world to see. A complex character study such as this requires a lead actress in the part who can expertly handle this material while also making sure her portrayal never turns into caricature, and Natalie Portman is perfect casting in every which way imaginable. Portman, in her best on-screen turn since Black Swan, portrays Jackie as someone who feels trapped in a situation that nobody should find themselves in, something that the often claustrophobic shots of facial close-ups and the cell-like bedrooms in the White House also attest to, yet also feels a personal need to milk the situation for all it’s worth, just so she can feel like the centre of the universe once more. It’s a heavily written part that, with one wrong note, could easily go south and present her as nothing more than an attention-hungry sociopath, but Portman finds the humanity and soul deep within her composed exterior, and brings it to the surface to play someone who may have selfish motives but is ultimately dedicated to the man she loved, even though he is no longer there for her. She is fantastic here, and deserves all the credit that she is currently receiving for her performance, and then some. It’s a gorgeously made film as well, with Stéphane Fontaine’s cinematography being particularly outstanding, as is the costume design that comfortably echoes Ms. Kennedy’s own stance as a fashion icon. Oppenheim’s script is tight, again allowing us to really get inside the skin of this person, and Larraín is a director who can make even the most tragic of on-screen situations look like a stunning arthouse film this side of Terrence Malick. 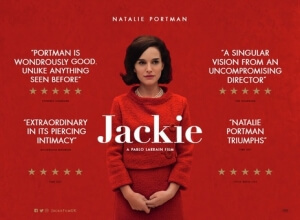 It is an absolutely beautiful film to look at as well as think about, because although Jackie tells a tragic tale of a woman who’s lost her husband, it also hints at a much larger and more thoughtful narrative that really allows us to finally, after years of being an elusive figure, understand her as a human being. It’s stunning to watch, stunning to think about, with a stunning lead performance; Jackie is just stunning. Jackie is a stunningly elegant portrayal of First Lady Jaqueline Kennedy’s grief in the wake of her husband’s assassination, but through some stunning cinematography, tight writing and direction, and a fantastic lead performance by Natalie Portman, it also allows us to see the raw humanity in someone forced to endure it all in the public eye.